Indeed it has been an intense and fiery year, with many changes and challenges arising, both for our society as well as for our Dharmata community of practitioners. 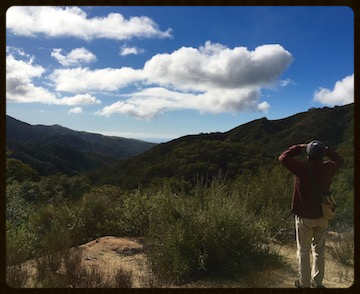 In January, our Dharmata sangha was able to complete the purchase of 15 pristine acres of retreat land in the mountains near Big Sur. It was the fruition of a long held aspiration to provide a sanctuary for us all to experience retreat time in nature and in solitude, to connect with our inner serenity – to rest in awareness. The first few months were spent setting up the land and its existing cabins, preparing Sweetwater Sanctuary for solitary retreats. Kay and Cory moved in as caretakers of the retreat land and in June, we opened the doors of the sanctuary. Then, as many of you are aware, just after the first practitioners began to arrive, the Soberanes Fire swept through the mountains of Big Sur, burning our land and many of the structures. Just prior to the fire, a few of us had come together to create a campaign to raise the funds needed to repay the loans, which had facilitated the purchase of the property. I had volunteered to coordinate these fundraising efforts. Everything changed when the Soberanes fire swept through Sweetwater Sanctuary on July 22, 2016. As dramatic and unexpected as this turn of events was, my commitment and resolve to assist Anam Thubten and our sangha to manifest this inspiring vision has only grown. Immediately after the fire we established the Emergency Campaign and with the generous outpouring of contributions from sangha and friends, we have raised $65,000 in contributions to date. We wish to thank all of you who have donated and all those who have volunteered directly on the land in the ongoing clean up efforts. We are now ready to begin the next phase – reconstruction. I’m writing to you today to invite you to join this effort to restore and rebuild Sweetwater Sanctuary. Now, more than ever, this unique place of retreat and healing is needed. It will take all of us pulling together, as the sacred third jewel of sangha, in order to accomplish the task of re-establishing Sweetwater and fulfilling our teacher’s vision. In this spirit, we have launched our Sweetwater Sanctuary fundraising campaign with the goal of raising $2 million dollars. Our campaign goal includes the funds needed to repay the loans secured to purchase the land as well as additional funds to restore the property and improve structures to better accommodate retreatants in the future. Once rebuilding is underway, Anam Thubten plans to include sacred images on the land and has the aspiration to build a stupa. While the property is covered by fire insurance, we anticipate there will be considerable expenses beyond what is covered. By becoming a “Friend of Sweetwater,” you can pledge an annual donation of $1000 or more towards the restoration and upkeep of the land and buildings. To find out more about becoming a Friend of Sweetwater, please email – friendsofsweetwater@dharmata.org. You can help us reach out to our worldwide sangha, by hosting a fundraising event for Sweetwater Sanctuary. Please contact me to discuss how you can help spread the word to your local sangha at (406) 370-0938, or Raquel@dharmata.org. We will also be posting updates on our fundraising efforts on the website. Please send me your photos and accounts of fundraising events at your Dharmata Sangha and I will include them in our updates. I encourage you all to stay connected by visiting the Sweetwater Sanctuary website. https://sweetwatersanctuary.dharmata.org. I invite you to be a part of this noble effort — to honor our teacher and establish this vision to provide a sacred place for all of us to deepen our practice and to be the light of love and awareness in this ever changing and uncertain world. For more information about current Sweetwater Sanctuary restoration efforts, please enjoy this video.